Properties in Nature Park of Molentargius-Saline average 4.6 out of 5 stars. * OFFER * Independent villa 150m from the beach of Kal'e Moru, (Geremeas), close to Villasimius and the best beaches of South Sardinia. 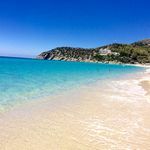 Property 6: * OFFER * Independent villa 150m from the beach of Kal'e Moru, (Geremeas), close to Villasimius and the best beaches of South Sardinia. 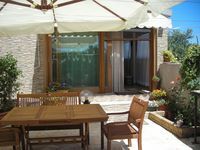 Villa with garden VIllasimius (SOLANAS) - WIFI - Air conditioned - Relaxation !!!! Property 11: Villa with garden VIllasimius (SOLANAS) - WIFI - Air conditioned - Relaxation !!!! EXCLUSIVE PANORAMIC VILLA near the SEA! Property 41: EXCLUSIVE PANORAMIC VILLA near the SEA! Wonderful property just steps from a beautiful beach. The villa is completely renovated, clean and very comfortable for a family of 4. It's well maintained by a local property manager who was more than happy to accommodate us with our needs or requests. It has a full kitchen, fully equipped for cooking meals when we chose not to eat out. Free WIFI (very important for teenage boys!) and cozy outdoor space. Close to a grocery store, restaurants, and the beach lounge was a pleasure to spend time at. We really enjoyed our time in Solanas, we'd go back to this property in a heartbeat. Very responsive hosts and plenty of space to unwind in at the end of the day. The house was also very clean and well equipped. The beds are quite firm so if you are used to a western style mattress you may find them a little hard.